The crossover between Marvel's small screen heroes on Netflix and the top dogs on the big screen has been something fans have clamored over despite never actually happening. Subtle references to the Avengers have been sprinkled through multiple seasons of each individual Defender's seasons on the streaming service but no real appearances or name drops have slipped into the mix. The Italian dubbing of Marvel's most recent series, Iron Fist, features a reference to New York's wallcrawler hero: Spider-Man. After scaling the Rand building and sneaking into Harold Meacham's office early in the season of Iron Fist, Danny Rand is approached by the man the world thinks dead. In the English version of the series, Harold compares Danny's scaling and break in efforts to Daredevil. Iron First and Daredevil are set to cross paths in The Defenders later this year, so it's not a surprise to hear the blind vigilante namedropped on his sibling series. However, in the Italian version, Harold namedrops Peter Parker's super hero alias Spider-Man when commenting on Danny Rand's ability to break into his hidden living space. The lines between the Marvel Cinematic Universe's Avengers heroes and the street-level heroes on Netflix has been blurry for some time now. While landmarks like Avengers Tower have appeared in the series based in New York City, the names Tony Stark and Iron Man have both been left out. Many fans are hoping to see The Defenders pop up in Avengers: Infinity War, which has been billed as "the culmination of the Marvel Cinematic Universe" but it doesn't appear that a crossover will happen. 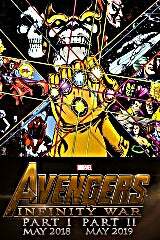 Those fans hoping to see Daredevil, Jessica Jones, Luke Cage, and Iron Fist alongside the likes of Iron Man, Captain America, Thor, Hulk, Black Widow, Hawkeye, Star-Lord, Spider-Man, Gamora, Drax, Rocket Raccoon, and Groot will have to continue flipping the pages of Marvel Comics rather than seeing it in live-action. As for Spider-Man, his next cinematic outing arrives this summer with Spider-Man: Homecoming which is a joint venture between Sony Pictures and Marvel Studios, building on his debut in Captain America: Civil War. Iron Fist is available on Netflix now. Spider-Man: Homecoming hits theaters July 7, 2017. Avengers: Infinity War is set for release on May 4, 2018.